Here it is the last day of February. Thirty below on my thermometer yesterday. Minus nineteen at the moment. I was about to say that based on these thermometer readings there's no evidence of spring approaching. Such a conclusion is untrue, however. Jack Frost is just doing a little magic using a bit of misdirection. If we focus too hard on the temperatures we might fail to notice that the days are getting longer. Spring really is around the corner. Here's my "short list" of events to make note of. The Second Annual Minerva Zine Party will be tonight at the PROVE Gallery in downtown Duluth. According to their Facebook invitation the event begins at 7:00 p.m. this evening and continues till 11:00 p.m. tomorrow. Minerva is a local feminist zine co-founded by Laura Gapske. The happening will include zine art, live readings of zine poetry, a library of zines for review and music by The Social Disaster starting at 8. If you miss my book signing because you attended Perspectives and Parallels, you are excused. I would be there myself if I weren't already slated here. In 2011 TJ Lind and I formed a publishing company of sorts called N&L Publishing. We published four eBooks at Amazon.com, three volumes of short stories and my Young Adult novel The Red Scorpion. Due to our inability to get newspapers to review my eBooks and other experiences, we decided to bring these four books into print. Unremembered Histories is the first of these. TJ will be flying back to the midwest today from his Rhode Island college and will be on hand as we make a short presentation about my writing experiences and our mutual publishing experiences. We will then be donating two books to the Superior Library. There's a surprise coming, but I can't tell you about it right now. Why? Because then it wouldn't be a surprise. 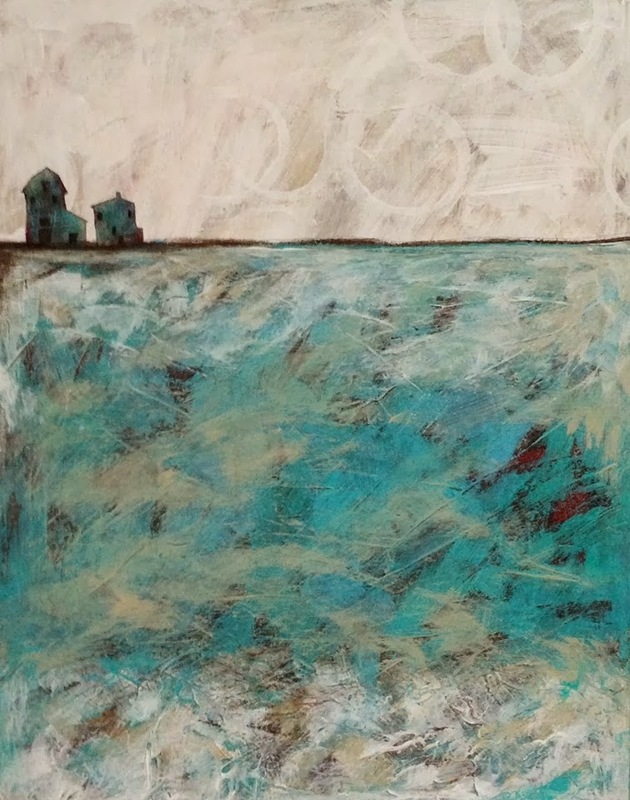 Erika Mock is opening her studio every Friday in February and March from noon till 7:00. 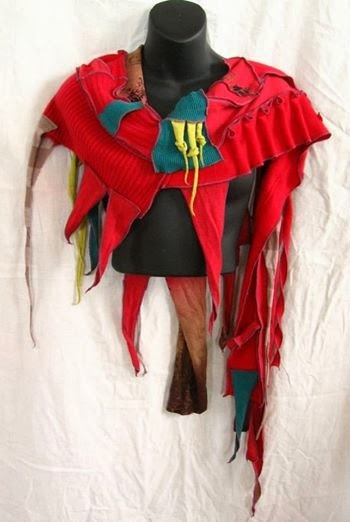 Mock is a textile and fiber artist whose studio is up in the far back of the Red Mug building, which houses a number of other artists including the Mud Sisters and Terry Millikan. Today is a "No Snow" day so there will be more parking available than the past few weeks. Grab a bite to eat at the Red Mug, or fresh bread at the bakery. Or find any other excuse you can to drop in and say hi. Special of the Day: 10% off wings and pulse warmers. Magic Marc Percansky and John Bushey of KUMD's Highway 61 Revisited will be the honorary MCs for this event. The house band looks to be all aces, consisting of Billy Hallquist, Gary Lopac, Matt Fink, Stan Kipper, Chico Perez, Lonnie Knight, Ralph Dacut. Confirmed guest artists include: Barry Thomas Goldberg, Gene LaFond, James Loney, Paul Metsa, Courtney Yasmineh and, yes, Scarlet Rivera once again. Several others are in the wings as we await confirmations. Mark your calendar for Saturday May 17. Tickets are on sale now for this Armory Arts and Music Center fund raiser spectacular. Near the beginning of this month we were treated to an impressive Super Bowl performance by the Seattle Seahawks and a powerful two minute Chrysler commercial narrated by Bob Dylan. I'm not sure which of these was more startling. I do know that the buzz after the game, regarding the commercial was fairly substantial. I saw Facebook posts of "sellout" by a few people and I was going to write a blog post about it, but found Rolling Stone had already captured my sentiments when it wrote the next day, "A great many Super Bowl viewers were shocked to see Bob Dylan in a Chrysler commercial last night, but they really shouldn't have been." Amongst the circle of Dylan fans I've gotten to know here in the North Country the unanimous sentiment seemed to be how cool it was. These are the people who have read the books, follow ExpectingRain.com, listen to his music and have all the albums, know the lyrics, have followed his career for their whole lives, and know all the highs and lows of the Never Ending Bob. And their reaction was this: He's never done the expected. Why would he start now? What prompted me to write about it this morning was yesterday's superb look-back at the Civil Right Movement on Minnesota Public Radio. The portions I got to hear while travelling back from lunch had to do with James Meredith at Ole Miss, and the shooting of Medgar Evers. In response to the first incident Dylan wrote Oxford Town. In response to the latter tragedy he produced what I consider one of his most powerful songs, Only a Pawn in Their Game. In the MPR piece they shared how Medgar Evers put his life on the line in his fight to abolish Jim Crow laws and to obtain the same rights for blacks that all other Americans had. Evers had put his life on the line for American freedom in World War II at both Normandy and the European Theater. The racist ways of the Deep South stood in stark contrast to things he had seen overseas and he took steps to rectify the injustices he saw all around him. MPR aired the vitriol that white callers directed to the television station that aired his seventeen minutes of FCC-enforced "equal time" in response to a white politician who had previously denounced the notion of equality for blacks. These hate-filled calls painted a painfully vivid picture. Dylan's Times They Are A-Changin' captured this moment and the songs he wrote became anthems for civil rights. And there were expectations that he would keep producing this kind of music, expectations that he dashed in a relatively short time. Two decades later a new wave of Dylan fans began following him. Slow Train Coming brought converts from the Christian sub-culture who embraced the "born again Dylan" and now claimed him as their own. But a few years and three albums later these fans became confused, wondering why he didn't continue producing Gospel songs. I recall Dylan answering this matter in an interview about the time his Oh Mercy album came out. He said, in essence, that once he said what he had to say he didn't feel a need to keep saying it again. He gave us the songs and others could take them forward into the world. In short, he wasn't going to be what this new group of followers wanted him to be either. A hallmark of the American dream is its homage to the notion of rugged individualism. Though Dylan's career has exemplified this, being a man who marches to his own drum has scraped more than a few people the wrong way over the years. Was the Super Bowl ad a surprise? Maybe. But it shouldn't have been. Whatever happens next, we already know Dylan is never going to be what others others want him to be. Kudos to you, Bob. Whatever you've got up your sleeve for the rest of 2014, we're looking forward to it. Meantime, my you stay forever young. Last night I had a chance to stop for an hour at Jeffrey Woolverton's Black Umbrella Books re-launch party. It was good to see Jeffrey/s enthusiasm for sharing his books and his publishing venture, and especially nice seeing the turnout despite bitter cold temps. The event took place at The Underground, that Depot space which formerly housed the Duluth Children's Museum. Woolverton, who has published under the pen name Jeffrey Woolf since 2007, gifted all attendees with his first volume of poems Givin' in to the... Blue Feelin', which has a cover designed like a can of Pabst Blue Ribbon beer. The reason I was happy about this was that I already owned a copy of the book and left it in a hotel room out of town on a business trip. A unique feature of the launch party, which included a cash bar, donated pizzas from Pizza Luce and a live band, was the projection of Alfred Hitchcock's The 39 Steps on the brick wall behind the drummer. Woolverton is a fan of film noir and The 39 Steps epitomizes the form. Tomorrow from 10-30-11:30, Burnet Art Gallery at Chambers, the Luxury Art Hotel is hosting a Facebook Q&A with Minnesota artist Anne Labovitz. Labovitz's exhibit titled Layers is currently on display there thru March 2. If I understand correctly, the way to participate tomorrow will be to log on to the Burnet Gallery Facebook Page and post questions or comments to which Anne will reply. I once conducted some virtual writing "talks" on AOL back in the early 90's before the existence of the World Wide Web. It was fun. I began one by typing, "I hope my tie isn't too loud" which brought a response. At the end, everyone in the room typed clap clap clap. Please plan to log on and participate if you have questions for Anne Labovitz. If you are reading this from California or New York, the Q&A will be conducted at Central Standard Time. The city of Superior has put out the call for artists to paint storm drains. To be honest, it isn't exactly clear to me what they have in mind other than to make people more aware of the need to keep our city beautiful, as well as our waterways. The City of Duluth installed a pair of Bob Dylan-themed manhole covers on Dylan's 70th birthday in 2011. Superior's Down the Drain art project will serve the public in a different manner. Organized by the Superior Environmental Services Division, the artists will paint on sidewalks directly associated with the city's storm drains. According to an article in the Superior Telegram, "Eye-catching designs could draw attention to storm drains and raise awareness about storm water pollution. Anyone over age 18 who lives, works or goes to school in Superior can submit a design." The newspaper story stated that interested artists will find the entry forms at www.ci.superior.wi.us/ I myself did not find it, but if you don't either, you can use the contact us button. As the evening was getting underway. ..
Dr. Seuss would have been 110 years old this coming Sunday. Send me a poem in the style of Dr. Seuss and I may just print it here. Should we turn this into a contest? What if I were able to get you some Dr. Seuss art as a prize? I make No Guarantees that a poem will be posted or a prize will be given, but give me your best shot anyways. Send to ennyman AT northlc.com. Sunday I posted a portion of my interview with Twin Ports painter Teresa Kolar, which currently appears in this week's Reader. There was more to be shared, however, and here's the second portion of that interview. EN: How long have you been selling work on Etsy, and what have you learned from this experience? TK: I have had my work on Etsy for less than a year. I am still in the learning stages with it. EN: What kind of training have you had? TK: I have taken classes from many people, one of the best known being Cheng Kee Chee. I attended two Golden Paints lectures/demonstrations by Bonnie Cutts. That is when I fell in love with acrylics. EN: Where else can people see more of your work? 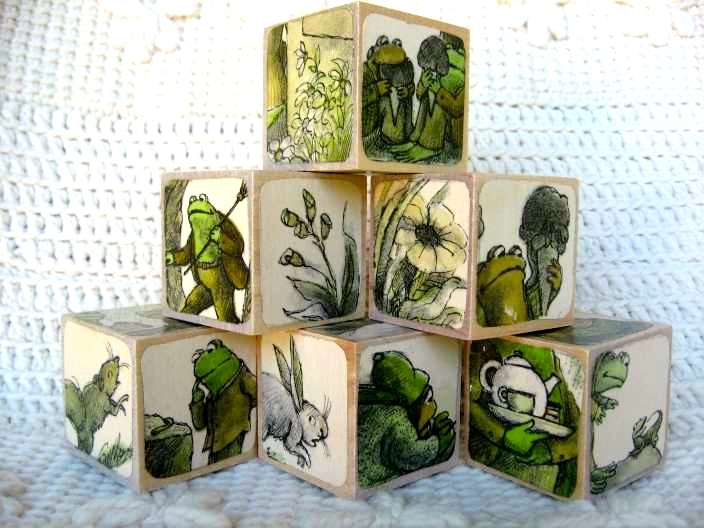 TK: I have original paintings and cards at Lizzard's Art Gallery and Framing. The Glensheen Museum Shop carries my cards and prints. Duluth Pack and all four Bibelot stores in The Twin Cities carry my notecards. I have a Facebook page, Purple Sun Studio. My work is also for sale on Etsy... and I have a web page at mnartists.org. EN: Have you had mentors along the way who especially helped you? Who, and in what way? TK: Mentors? Hmmm... I would have to say my first mentor was my mother, Marlene Cox. My mom is a painter. She has been since I was a little girl. She took college art courses while raising five small children. One of her assignments was a study of Van Gogh and his sunflowers. It hung on our wall. It was an inspiration to me in so many ways. It symbolized my mother's love for art, an open door for me into the arts, hard work and dedication in the midst of chaos. Mom was a volunteer at the Duluth Art Institute. These memories help me to feel "at home" with the arts. My mother never pushed me in any way. She just lead by example. As a young adult I admired Jan Wise. 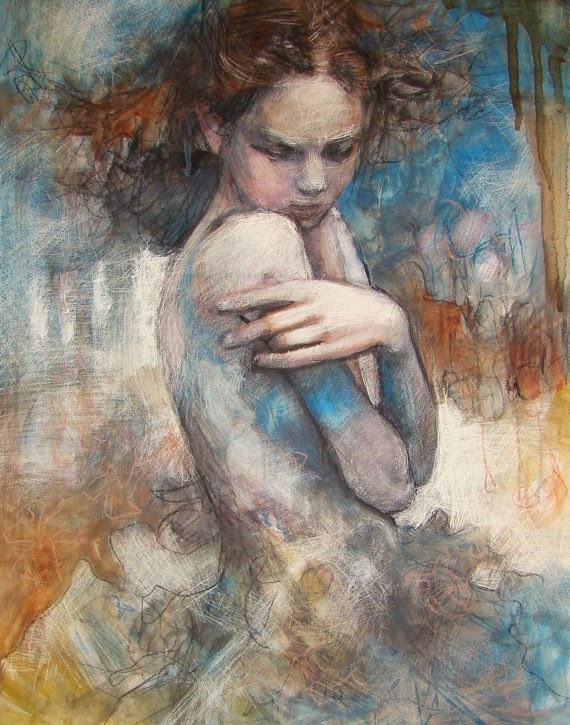 Her watercolor and mixed media pieces had strong spiritual elements. I was so intrigued by her creativity. Watercolor was such a challenging medium. Jan's work and teachings were so inspirational while I "made my way" with watercolors. 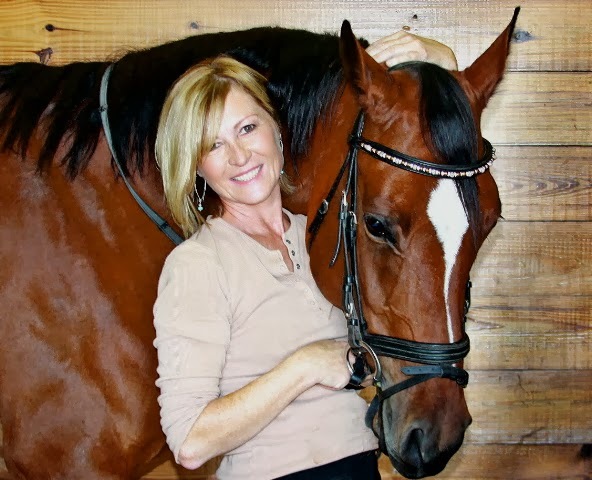 Now, I would have to say I am continually inspired by my close friend, Lori Franklin. Her attitude about life and art is something that I aspire to. She is so kind, positive and creative. We often paint together and every time we part I have something new and wonderful to think about. It might be a story of every day life or a new art material tip. We are attracted to opposite colors in our work and our subject matter appears to be different but, we respond to the same things as if we were sisters. We have been friends for well over 20 years. I am always so thankful for her friendship. I admire her and her family. They are role models for me. 1) Tonight Black Umbrella Books is hosting a Re-Launch Party @ the Underground, on the first floor of the Duluth Depot. If you bring a used book you can purchase Jeffrey Woolf's Apples of Arcadia for half price. The used books will be donated to Life House, where the author helps homeless and troubled youth get off the streets and back into life. 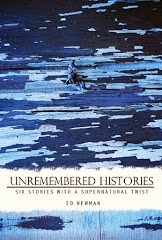 7:00-9:00 p.m.
2) Next Tuesday the Superior Library will be hosting a book signing for my book Unremembered Histories. Details here. 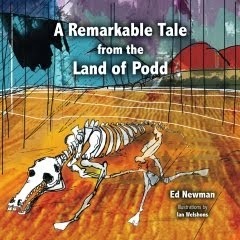 More about the book soon at Ennyman's Territory. 3) It's never too early start getting events marked on your calendar as we head into spring. Saturday May 17 at the Sacred Heart there will be A Salute to the Music of Bob Dylan. This year's event will be the biggest and boldest ever. The list of musicians signing on to make this the music night of a lifetime will knock your socks off, which is what happens when you are hit by a car. Scarlet Rivera, Geno Lafond and Courtney Yasmineh will be back, but there's a whole host of others wanting to pay tribute and help raise funding for the Duluth Armory restoration. This undertaking is sponsored by the Armory Arts and Music Center along with Magic Marc Productions. Yes, not only will it be a magical night of music, but also a pair of live magicians will be performing. You might as well start buying tickets now. Proceeds will go to the AAMC Fund. More info will be forthcoming. I promise, you will be impressed. There are a variety of ways to watch a film, look at a painting or listen to a piece of music. One of the ways I frequently look at movies or listen to music is to think about the decisions that went into making it. For example, Picasso's Guernica. How did he decide on the size of the canvas? It is an enormous piece, but it speaks to the enormity of the horror in the story it tells regarding the bombing of a Basque village during the Spanish Civil War. And why black and white? I am guessing the latter because he did not want to exploit the blood red violence and was focusing our attention on the emotional trauma instead. When it comes to film, all kinds of decisions must be made. Casting itself is a major decision that can make or break a film. Bonfire of the Vanities was a disastrous film because of the decisions made during casting, thoguh also in part because of the treatment Brian De Palma gave it. All the best movies are notable, in part, because of the casting. The Godfather, Reservoir Dogs, The Illusionist, Moneyball... these films work because the characters fit the bill. Long before there's casting, every Hollywood film begins with a story. The writers of that story have decisions all along the way. Before hooking the viewer, the script must hook the reader, a potential producer. How do we introduce the characters so that it is not overwhelming? How do we introduce the story's theme? Woody Allen, in his film Blue Jasmine, begins with the screwed up Cate Blanchett unloading some of the mess that is her life to a stranger seated next to her on a plane. Within minutes we get the picture, and it devolves from there. Hitchcock's storytelling in film is legendary. In films like Rope and Rear Window, he completely restricts the camera -- and the viewer -- to the very narrowest confines. 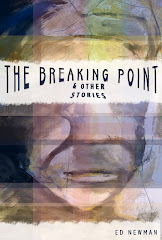 He challenges himself while enhancing tension within the story. Of course there are all kinds of devices for heightening tension, including the music score or sound effects. Try watching Psycho with the sound track of Marx Brothers' Animal Crackers. 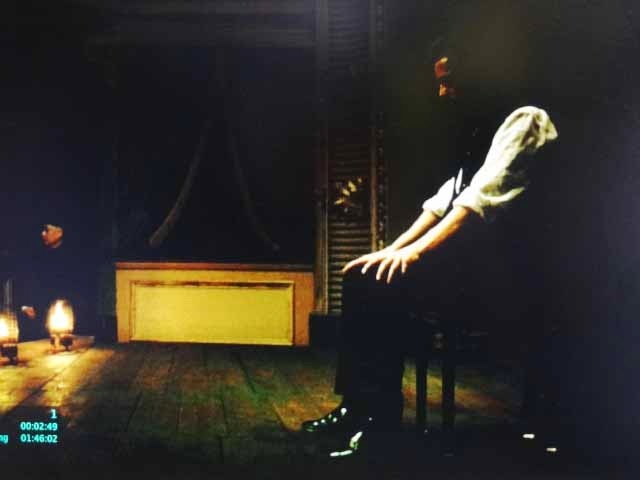 Another device is having the audience know something that people in the film do not know as in the movie Rope where the audience is aware, but Jimmy Stewart, that there is a dead body in the room. In music, too, countless decisions must be made. I think here of Beethoven's Fifth Symphony, and specifically the climax of the third movement, it's remarkable ascending rush and faux culminations, repeated again and yet again leaving the hearer both thrilled and exhausted. Often I like to open my blog entries, and my stories, with a thought-provoking quote. If I can find something quickly and suitably pithy I may throw one in here at the beginning of this entry. Right now I am trying to decide what graphics to use to accompany this page. I am also trying to decide whether it's maybe time to give the blog a facelift, to give it a new look. Finally, there's the close. Fast and furious? Or a more leisurely exit? Let's see what happens. The very best to you, and have a great day. Thanks for stopping by. I first met Teresa Kolar at one of the Phantom Galleries Superior openings in late 2012. Her paintings were readily distinctive and uplifting, as was her spirit. I later saw more of her work at a Clyde Iron Works event (Charlie Parr was playing that night) and it led me to want to get to know more of her story, which I am sharing here. EN: You work in a variety of media. What are your favorite mediums to work in? TK: Yes, I have worked in various mediums. Approximately 25 years ago I started taking classes for watercolors. I worked in that medium for several years. Then, I changed to pastels for two or three years. Finally I discovered acrylics and have been working with them ever since. Each medium has its pluses and minuses, of course. It was a matter of choosing the one where pluses outweighed the minuses. Watercolors are wonderful because of their transparent beauty. Working with them was good for my character. They tested my patience and dedication, but I liked so much the way they looked. I just wanted to become accomplished enough to render attractive results and enjoy a positive experience while using them. That was tough! They are an unforgiving medium. Then, when you get a piece done you have to mat and frame it. Very costly and time consuming. Eventually I became intrigued by qualities of pastels. The colors were so rich and ethereal. (I had not yet learned my lesson about framing. Pastels are even more labor intensive than watercolors!) Needless to say, my relationship with pastels was short and sweet. I loved the colors, I did not like the dust and the framing. That's when I started thinking about acrylics. I attended a lecture/demonstration of Golden brand Acrylics by Bonnie Cutts. I was hooked! I loved the richness of the colors, the variety of materials the medium offered AND NO FRAMING! 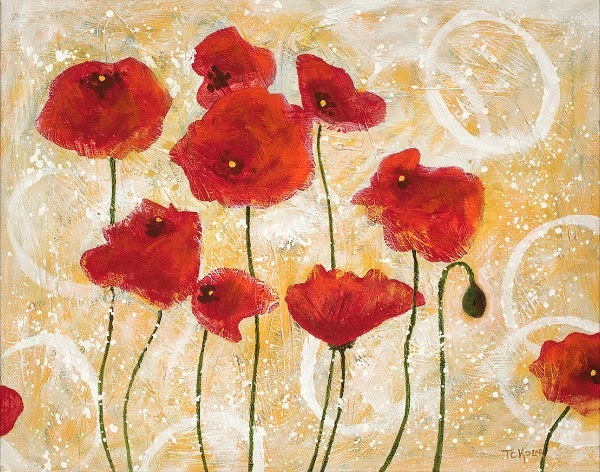 I loved painting on stretched canvas knowing that when I was finished it was ready to hang! I was thrilled to be able to make changes if needed by painting over previous things. Changing my mind when working with watercolors or pastels was just never an easy option. Acrylics were my new found love. EN: Birds seem a popular theme of yours. What got you interested in the birds? TK: I love animals and things found in the wild. 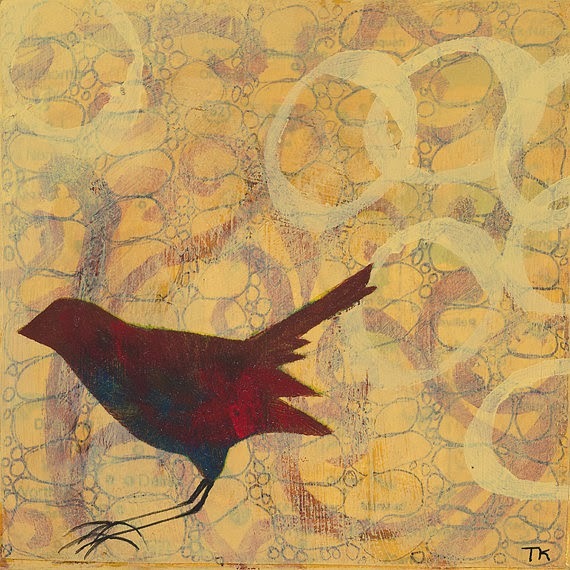 Birds are a wonderful and whimsical way to stylistically record nature. EN: What are some of the other recurring themes in your art? TK: I enjoy painting horses, trees and flowers. I adore clouds but, I haven't figured out how to interpret them successfully yet. EN: When did you first take an interest in making art? Who were early influences? TK: I have loved "making things" since I was very young. I started watercolor painting approximately 25 years ago. I took as many workshops as I could. Some were at the Duluth Art Institute, some were out of town. The most influential person regarding my art is my mother. She has been painting since I was a child. She would sing as she made her way through our house. She brought us to plays. My mom lives life in an artistic way. She always has and I have noticed and enjoyed that ever since I can remember. EN: Casual observers sometimes miss details that the more engaged viewer might catch. What are one or two things you'd like to see people notice about your work that they might otherwise miss? TK: Long ago I enjoyed painting about things I had read. 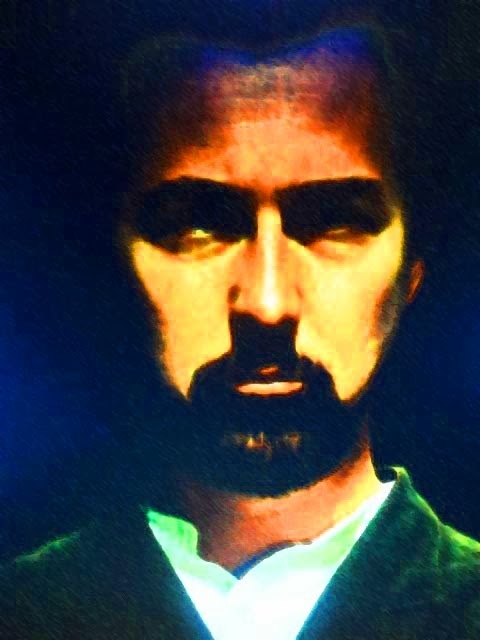 Stories were often inspiration and impetus for getting a painting going. Now I tend to paint about things in my life. Things that make me happy. I also love experimenting with different mediums and textures. Sometimes I will "hide" things in my work. Sometimes things show up that I didn't realize were there. This is why I believe art is magical. Things will appear that you weren't planning or intending. People will see one's work and be influenced in ways never thought of. I have connected with people through my art more times than I can count. It's as if there is a part of me out there connecting with others even though we have not met. If by chance, we should meet, it is like we already know each other a little. That is what art does--not just my art, but The Arts. It creates connections. It is like magic and that is why I love it. The above interview appeared in this week's Reader. I will be sharing more of her story in a follow up blog entry later this week. 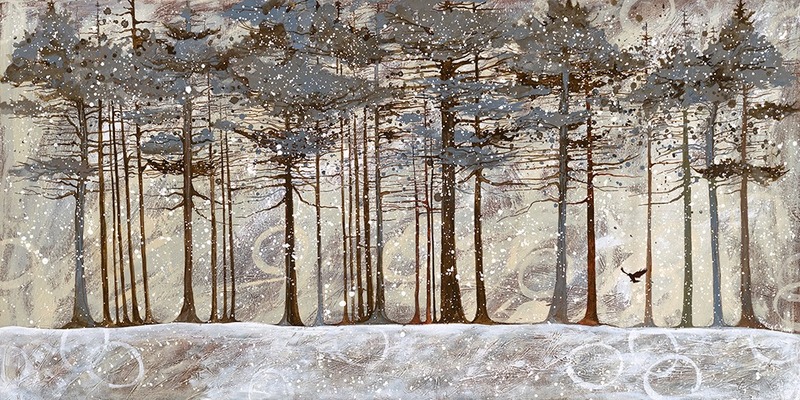 To see more of Kolar's work visit her Etsy store. Does Our Excessive Busy-Ness Make Us Feel Important? This past week or so I read two articles that struck home with me. Each dealt with by-products of modern culture. The first, and I didn't note where I saw it, had to do with constant background noise from television, radio, CD players, etc., citing how averse we've become to "dead air." That is, we're uncomfortable with silence. In the radio business there is nothing worse than dead air. I suppose that it's a necessity to have continuous sound or chatter because if a potential listener tunes in and there are long, thoughtful pauses between sentences they might turn the channel thinking that the station is off the air. The problem comes when we fill our lives with noise, with chatter, with continuous background music. When we're with other people and we don't know what to say, we feel pressure to fill the air with babble. When someone is silent it doesn't mean something is wrong. Quiet is actually healthy. We don't have to fill the air with noise. When we're with others, t's acceptable to just enjoy the quiet together. Sometimes those quiet times can contain the best moments of all. The second piece that caught my eye, and stopped me in my tracks, was an article at ReadWave titled "You're Way Too Busy To Read This." ReadWave is a nicely designed hub for short, thought provoking articles and stories. Three minute reads is their specialty. It's a gathering place for new writers, providing an opportunity to share one's own work in a different kind of social media environment. The title itself hooked me in. Yes, I was way too busy to read this, but I was intensely curious where the writer was going with it. So I clicked the link and took the plunge. You can always leave in ten seconds if the opening fails to grab you. But Sydney Geyer's opening did grab me. I went with it. Modern society is a place where stress is in vogue. The frequency with which we drop hints about the trials of everyday life goes largely unnoticed, but it’s a quiet problem reaching epidemic proportions. It has become a reflex to fill the silence with grievances about chores we must do, engagements that we must attend, and responsibilities that we have assumed. And, at this point, the proportion of conversation dominated by complaint has reached unacceptable heights. Even if you don't agree with all his generalizations, there's real food for thought here. Paragraph two tightens the screws. Why do we do it? What is it about external pressures that make us want to commiserate endlessly with others? A significant part of the allure lies in the desire to feel as though we’re not alone—as the saying goes, misery loves company. But something more lies under the surface. Our stress levels, in a sense, have assumed the role of a measurable form of importance, a meter-stick against which we can compare our contributions to those of our peers. The next paragraph sums up the root of the matter. Our culture is one that glorifies being busy.... The busier we are the more significant we feel. It's a problem. Maybe moreso for some than others, but it hits at a core issue for many lives. What is it that gives my life meaning? And the corrollary, at the end of the day, what really matters? If you're not too busy, it's a good read. Meantime, hang in there. Have a great weekend. And if you can find the time, stop and smell some roses. The first published article for which I received payment was titled "Make a Game of It." 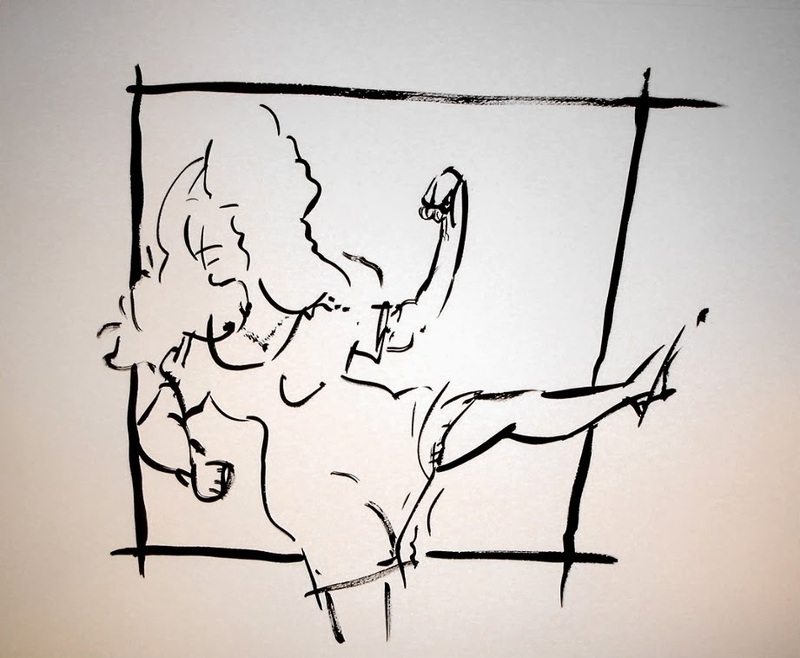 The concept had to do with using a more creative approach to teaching. By means of games, creatively crafted, we can sink home insights, ideas and facts in a manner that is both entertaining and engaging. What brought this to mind was our recent snowstorm that has smothered the Northland. As adults we see these storms as inconvenient at best and troublesome or even dangerous at worst. More than a few older men have had heart attacks while shoveling snow. When we were boys, however, fresh snow meant either making some extra cash shoveling driveways for the neighbors, or just having fun. Kick the Can, Freeze Tag and the like. But I'm willing to guess there are places where a creative kid invented a few new games which, even if not widespread in popularity, were tremendously fun for the kids in that neighborhood. The two I'm thinking of here tonight were of my invention. Based on the buy-in from other kids in my New Jersey neighborhood they were pretty good games. My family lived in one of the new mid-Sixties housing developments in Bridgewater Township. If you look at the topography of the Eastern United States you'll see the foothills of the Allegheny Mountains begin here in Central New Jersey. Our home abutted the Public Service Grounds where power lines climbed up and over the foothills which would eventually become mountains further west. As a teen I was big-time into sports and had a subscription to Sports Illustrated. I read an article about a sled dog race in Alaska and the idea of racing through the snow down the side of the mountain seemed really cool to me. Somehow I talked a bunch of the neighbors into the idea and we headed up to Washington Valley Road and huffed our way up the Public Service Grounds. It took about fifteen to twenty minutes or so to climb to the top, and one minute to race back to the bottom, many of us losing control, flying through the air only to land in deep snow. Occasionally someone would lose a boot. Even when we landed on rocks it seemed we were so padded with winter gear that no one ever go hurt. And once at the bottom we'd all look at one another and say, "One more time?" It was a blast. The second original game we came up with was more psychological in nature. This is the game that came to mind as I blew the driveway and shoveled walkways today. For lack of a better name we'll call it Manhunt. Manhunt was a game we could only play when there was freshly fallen snow that no one had yet marred. It went like this. One of us would become the hunted. The others became the hunters. Out of fairness, we always rotated who the hunted would be because this was a game of wits and it was tremendously fun to see if one could outwit one's hunter friends. Here are the rules as I recall them. The hunted was given a head start of fifteen or twenty minutes, and the rest of us would begin our pursuit. There were boundaries outside which the hunted was not permitted to go, but the area was quite large. The hunted was handicapped by the size of the area, and the hunters were handicapped by the amount of time designated to find their prey. Whether hunted or hunter, it was a thrill. I remember trying to hide my tracks by swinging through trees, or walking through a creek with several exit points to delay the hunters. Even with nothing at stake -- no one was going to beat me or arrest me or shoot me -- it was an adrenaline rush striving to escape, to not be caught or found. Today, the fresh fallen snow may be beautiful, but it's getting a bit tiresome having to move it off the roof and the driveway. Maybe I need to think up a new game to make it more invigorating. For the record we've had quite a bit more cold than usual this year in Northern Minnesota. And, for the record, we've quite a bit of snow as well. It's been a while since I heard so many people complain about our winters here. Today we're being ravaged by yet another "snow event" and as I blew the snow off my drive tonight (knowing I would have to do it yet again tomorrow morning) my thoughts kept culling the positives from this current blast. Here are a few of them. 1) It's a wonderfully balmy 25 degrees and not 25 below with a wind chill of forty below. Sweet. 2) The fresh snow will look gorgeous when the clouds clear and we have sun again. It always does. 3) The forecast was for a wet, heavy snow. This snow was thin, lightweight and relatively pleasant to blow thus far. 4) The forecast was for 1-4 inches this afternoon and then an inch an hour for the next twelve. From what I could tell only a half inch fell in the hour I was clearing my 300 foot driveway and walkways. 5) The electric start on my snow blower failed earlier this winter. After trying to figure out how to fix it I learned that the electric start was a luxury and the pull cord would get the snow blower started even without it. I don't know what we'll find tomorrow morning but so far it's just another snow event here. The roads get cleared and life goes on. In today's world even if you can't get to the office you can still do email there and interact, make progress on projects and meet deadlines. Alas.... it's a whole new world. For closure, here's a poem rich with warmth by Percy Blythe Shelley about winter. I recently visited the Waters Edge Animal Hospital and was so impressed by the art there that I asked for a small tour. 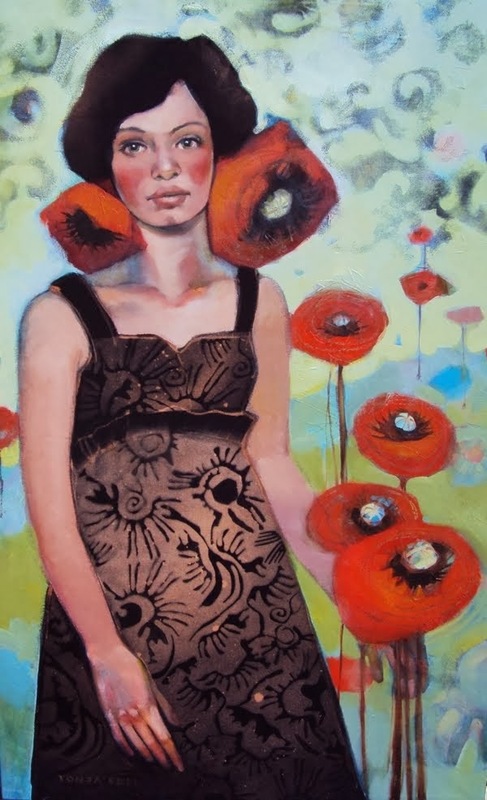 The clinic, run by Dr. Tirzah Pop, features paintings by several artists as well as ceramic works, including pieces by her husband artist Silviu Pop of Romania. The tour made me think how drab and ordinary this space would be without art. Instead, the art here transformed the clinic into a welcoming space. This was no longer a vet clinic or a box shaped brick building on a busy commercial road. Once again I was affirmed of the need for artists to make our living spaces more inviting, but also the variety of other spaces we inhabit. They are an essential part of our lives in often quiet ways that we take for granted. This is why we cannot cut the arts out of our schools or defund the arts in our communities. Who will make the paintings or design the interiors of our children's homes and businesses? It certainly won't be the engineers. All this to say it was refreshing to see the cat room, the dog room, the bear room and the rest as I dropped off one of my own pieces, a print of my painting Dogs of War. Coincidentally, today marks the birthday of Romanian-born sculptor Constantin Brancusi in 1876. Silviu Pop is himself from Romania. As an artist he has been a welcome addition to our Northland arts community. Both Tirzah and Silviu have big hearts, the kind of people who give back. Check out their space. 332 East Central Entrance in Duluth, accessible from the highway as well as the frontage road behind. Pick up a business card while you're there. And if you need services for your dog, cat, goat or whatever... this is a good place to get to know. 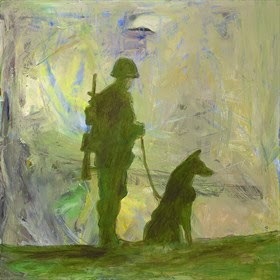 At my Many Faces of Ennyman art blog you can read the background on this piece, Dogs of War. A limited number of 18"x 18" giclee reproductions of this work are available for $200 each. Smaller sizes of the print may be purchased on request. One of the strong memories from my youth was my dad's habit of reading the Sunday paper while listening to his albums of classical music. Most memorable of these were Dvorak, Beethoven, Tschaikovski and Echoes of Offenbach, among others. Tonight there will be a special performance of chamber music by the DuSu Symphony Orchestra at the Underground (inside the Depot). At 5:30 there will be a social time in advance of the 6 p.m. music. Erin Alridge will be playing a piece with two percussionists and another piece with a string quartet (Dvorak). In addition, Betsy Husby has organized Villa Lobos, an 8-cello piece with a singer, and the symphony's brass section will be featured on Poulenc Trio Sonata for trumpet, trombone and French horn. The Zinema's weekly Tuesday night series is designed to stimulate new perspectives and give you a chance to venture off the beaten path of cinema. UWS Philosophy Professor Dr. Sarah LaChance Adams will guide us through one of the great minds of modern thought, Slavoj Zizek in "The Pervert's Guide to Ideology." Cultural theorist Slavoj Zizek is once again teamed up with director Sophie Fiennes (The Pervert's Guide to Cinema) for a romp through the crossroads of cinema and philosophy. Zizek essentially dissects a number of epochal films in order to explore and expose how they reinforce prevailing ideologies. What appeals to me here is the invitation to see films I've experienced analyzed from an alternate angle. According to the invitation: As the ideology that undergirds our cinematic fantasies is revealed, striking associations emerge: What hidden Catholic teachings lurk at the heart of The Sound of Music? What are the fascist political dimensions of Jaws? Taxi Driver, Zabriskie Point, The Searchers, The Dark Knight, John Carpenter's They Live ("one of the forgotten masterpieces of the Hollywood Left"), Titanic, Kinder Eggs, verité news footage, Beethoven's "Ode to Joy" and propaganda epics from Nazi Germany and Soviet Russia all inform Zizek's stimulating, provocative and often hilarious psychoanalytic-cinematic rant. Dr. LaChance Adams will give a small talk after each film and then lead a discussion with anyone in the audience who wants to explore the ideas brought up in the film further. Slavoj Žižek is a Slovenian Marxist philosopher, psychoanalyst and cultural critic. He is a senior researcher at the Institute for Sociology and Philosophy, University of Ljubljana, Slovenia. No matter your ideological bent, it can be an interesting and often enlightening experience to see perspectives beyond the confines of one's own established convictions. The show begins at 7:00 and is $9 for adults, $7 for students, and $6.50 for seniors. This Friday… Why the Armory Matters Winter Dance Party. MUSIC, DANCING, FOOD and MORE! Here's another creative fund-raiser to help the Armory Arts and Music Center and its program the Music Resource Center commemorate the 1959 Winter Dance Party featuring Buddy Holly, Ritchie Valens, Dion and the Big Bopper that was held at the historic Duluth Armory. Rock-a-Billy Revue will provide 50's music to dance to. There will be a brief demonstration of 50s dancing at the beginning of the night for those interested in learning a few steps. There will also be hors d'oevres, cash bar, and a silent auction. Event to be held in the Greysolon Ballroom, 231 E Superior St. in downtown Duluth. The Winter Dance Party will feature ROCK-A-BILLY REVUE playing the biggest hits of the 50s. Have a good time and get your dacing shoes on. It's a throw back to the '50s including live music, cash bar, hors d'oeuvres and a silent auction with some very special items. ALL PROCEEDS GO TO benefit the Armory Arts and Music Center and its music resource center program. The historic Duluth Armory was the site of the 1959 Winter Dance Party concert featuring Buddy Holly. Get Tickets Here. Some of the businesses that have donated items for the silent auction: Rosewood Music, Superior Ballroom Dance, Adeline Inc., Bent Paddle Brewing Co., AJ's Tanning, Lizzards Art Gallery & Framing, Self Discovery Adventures, Country Inn & Suites, Cascade Lodge, Schmitt Music, The Tent Guy, Shannon's Stained Glassery, Lynnette's Portrait Design and more. Thank you. Twin Ports Stage and Wisconsin Public Radio will present Episode 5 of their live radio soap opera "Twin Ports" at the Belknap Lounge, 130 Belknap Street near the campus of UWS. Next week, on Thursday the 27th, the Two Harbors Public Library is having an opening reception in recognition of the fabulous installation by Tonja Sell and Nancy Miller. Here's yet another example of the value and power of public art. If you are able, Two Harbors is just a hop, skip and a jump from the northeast end of Duluth on one of the most scenic highways in America. The soon to be dedicated installation at Two Harbors Public Library. Friday eve there were two more Valentine-themed art openings. Here are some of the things you might have seen had you been able to pry yourselves away from the Olympics. The Washington Galleries show had a lot whimsical imagery as their call said they were seeknig "funny, silly, sappy, quirky, corny, odd, goofy, and peculiar musings on love and romance in the form of visual, written, or fine art for a show entitled "My Funny Valentine." The Quaintrelle show at the PROVE delivered a range of more serious work. Here are some of the pieces that caught the attention of my camera. Monica Ayres captures the evocative mood of the city after dark. Emma Rustan painting has the feel of stained glass. Friday night we had a chance to see a pair of Valentine-related art openings. I’ll be sharing some snippets of our sightseeing here soon. One of the artists represented at the PRØVE was Tonja Sell of Brule, Wisc. 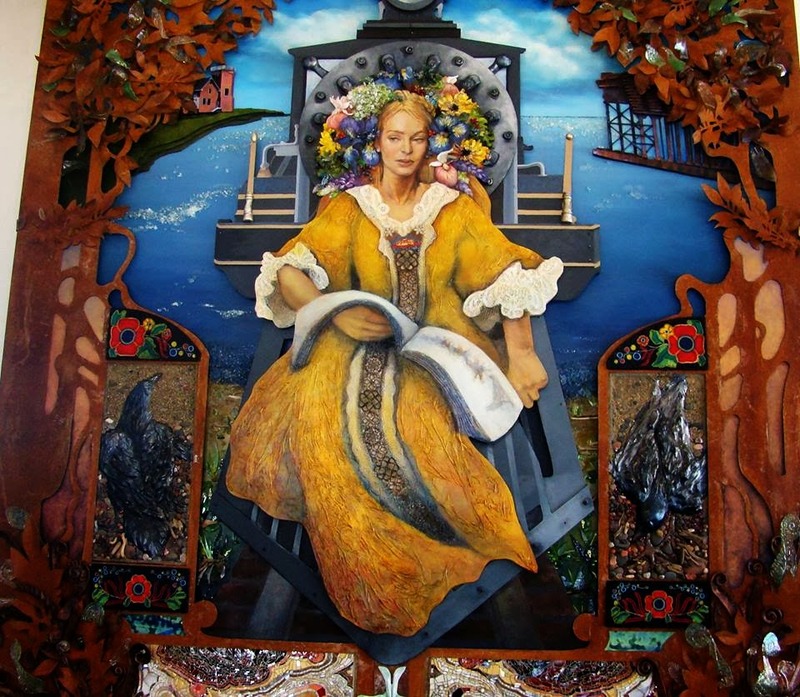 whose work has caught the attention of countless local art-watchers here in the Northland. She has been invited to Tuscany, Italy in September with Karlyn Holman of Washburn, Wisc., an artist/gallery owner/teacher in the States and abroad. Holman has led up to sixteen international trips a year but is winding down a bit now as she is in her 70's. According to Sell, “Karlyn has taken me under her wing a bit and is showing me how she operates her business and trips. 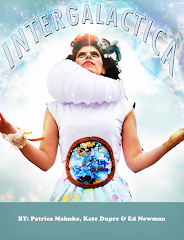 She is going to Andalusia, Spain on May 16-24th with a group of professional artists-teachers staying at the La Finco del Niňo for seven days. She already has a busy year lined up that includes murals for the Discovery Center in Chisholm, MN and an opening at the Two Harbors Library for an upcoming mural project happening there on Lake Superior’s North Shore. On top of everything else she’s felting up a storm and doing a clay-collaboration project with Jonathan Walberg from Washburn. Her fund-raising plan is two-fold. First, she will auctioning off some of her work via her Facebook artist page. The auctions will be conducted in real time and each piece that reaches her reserve price will be sold to the highest bidder by midnight. This means you will want to follow her on her Tonja Sell--Artist Page where she'll be posting the piece of art that is on the auction block that day. To bid, send her a private message. Her second means of raising funds is a 50% Off sale at her Etsy site. To get this special price you will need to type in the promo code GET2SPAIN in the coupon code checkout box when you place your order. NOTE: THESE INSTRUCTIONS ARE AS ACCURATE AS I UNDERSTAND THEM and will possibly be slightly clarified when Tonya reads this. One reason I am promoting this today is that local art history has shown how valuable these kinds of experiences are for artists who have traveled abroad and returned to enrich us here. It's not for Tonja but for us. I believe we will see some new and remarkable work from her in the future because of this. Thank you, Tonja, for your example of creative innovation, industriousness and discipline. The best to you you in this new adventure. Where Have All the Short Story Writers Gone? Once upon a time short story writers could make very good money. In the days before movie theaters and television, magazines like The Saturday Evening Post offered some of the best entertainment around. And they paid well to get these marquis writers on their covers. Around a century ago the highest paid of these scribes was a writer named Jack London. During the Roaring Twenties F. Scott Fitzgerald earned in a week what most people made in a year, simply with his typewriter. I began writing short stories in high school. I'd like to believe they were very good stories, I suspect that the caliber of the ideas exceed the writer's ability to execute skillfully. Much like my drawings, the stories were original, even if handled clumsily. One of these, for example, was a story told from the point of view of a stick of chewing gum. It have alienation and despair, longing, suffering and satisfaction. It wasn't till the eighties that I took seriously my efforts as a writer. I attended writers conferences and participated in a few writers groups. And, among other things, I wrote stories. At the Robert Wright Writers Conference I attended in 1985 (Mankato State University) I learned to my dismay that most of the magazines publishing writers have already filled their slots for the next ten years. That is, the big name writers who will increase sales by having their names on the cover are the ones who already have assignments. Stephen King, William F. Buckley Jr., etc. In short, your best bet was to do the tedious business of finding publications by means of the Fiction Writers Digest or a place like The Loft in Minneapolis where all there literary mags are assembled in one place for your perusal. So it was that when the Internet came along, I placed my stories in cyberspace because I wanted to share my work. The work I wanted to be doing was creating, writing. Not studying markets. Not figuring out how to write a letter that someone would notice in the midst of ten thousand other such inquiries. To my delight, I discovered an audience. 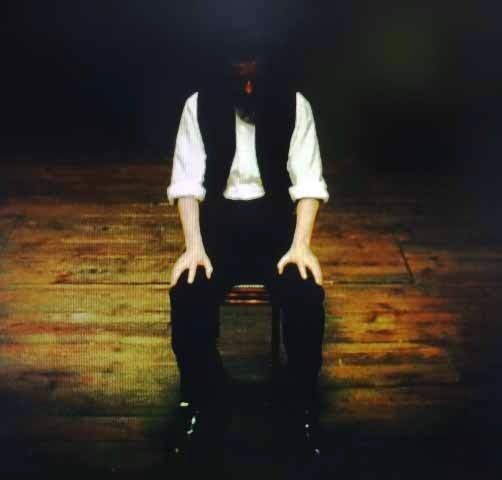 Somewhere in the mid-90's a Croatian poetry group asked permission to translate my story Duel of the Poets into Croatian as a centerpiece for their site. A Russian publication asked to translate one of my stories into their mother tongue, and a fellow in France asked to translate my story Terrorists Preying into French. Two of my daughter's stories were later published as well--in California and New Zealand--after I posted them on my website. The Internet quickly demonstrated its power to change the playing field. Those early tremors were exciting on one level, but there have been consequences. According to Ted Genoways' article in Mother Jones publications that once existed to showcase emerging literary talent have been folding. Other publications that once had at least one short story feature have ceased from the practice. Is fiction dead? No. But will writing fiction get you paid? That's a different game. And like performing in a band or making art, doesn't it really down to motivations? Why do we do the things we do? The reality is that there seems to be more opportunity for writers than ever. That's why one million books were published last year instead of the 50,000 books of 1985. One hundred years ago there were no television sets. No movie theaters. No radios. The Saturday Evening Post was your entertainment. Or making music Saturday night in the barn. Yet despite the multifarious means of getting distracted these days there's still a vast portion of the population that seems deliriously happy to do nothing more than curl up with a good book. And if you like short stories, as many readers still do, I hope you'll find a way to curl up with some of mine. Unremembered Histories is my first in print. I'd be honored if you tell me what you think. I've had a chance to overhear some of the planning for this year's Dylan celebration and am excited to share that our May tradition will be bigger and better than ever. Like the return of hummingbirds, apple blossoms and baseball, it happens every spring. Here's a brief snapshot of the Twin Ports portion. 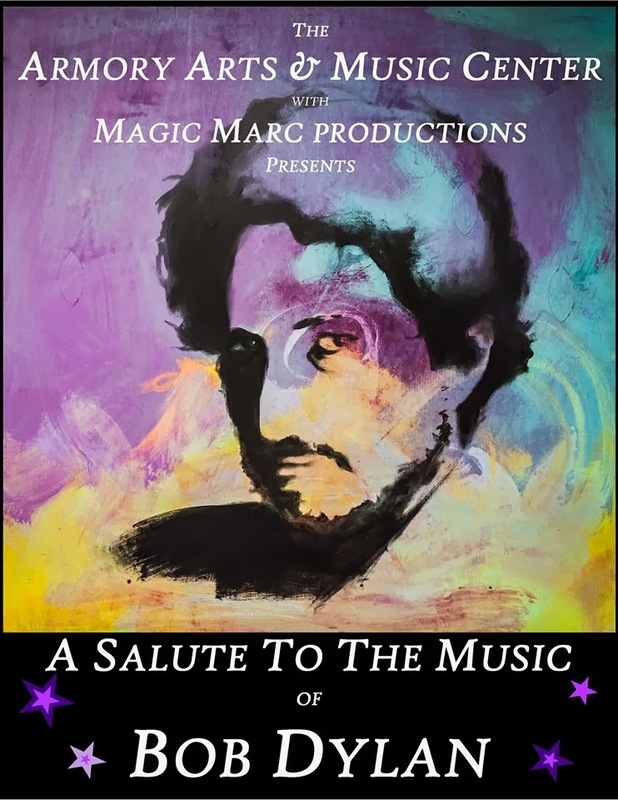 On Saturday May 17, the Armory Arts and Music Center in conjunction with Magic Marc Productions will present A Salute to the Music of Bob Dylan. This year's event, to be held at Sacred Heart on Duluth's Central Hillside, should be tremendous. It will not only include a whole catalog of musicians along with a live magic show featuring magicians John Bushey and Marc Percansky. During the month of May The Red Mug in Superior will feature artwork inspired by Dylan with a special reception on May 20 featuring an evening of poetry, wine and pastries, followed by music in the newly remodeled space to be named The Tapas. If you are an artist you should check out our CALL FOR ART on Facebook. We're eager to recognize you. Thursday will once again feature the Blood on the Tracks train excursion to Two Harbors, with music at both ends of the train, up the North Shore and back, and in between. Details will be forthcoming in the months ahead as event planners sharpen their pencils and their wits. On Friday the action shifts to Hibbing where the Zimmerman family moved when young Bob was six. If you've never been to Zimmy's you owe it to yourself to make that trip someday, and Dylan Days would be as good a time as any. Saturday the 24th Bob turns 73. Light yourself a candle, and don't wear sandals. 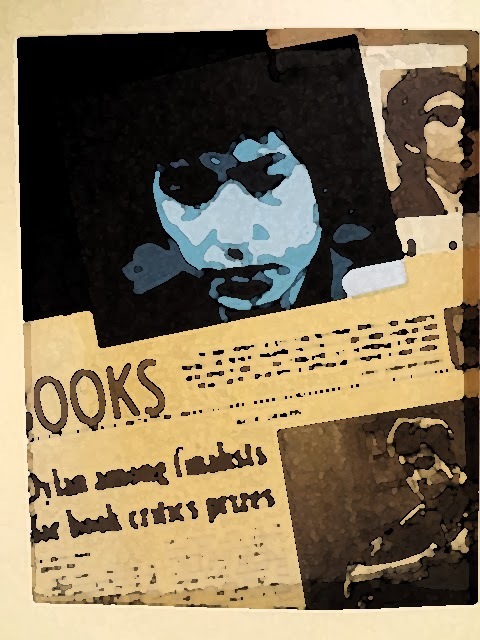 Here's a link to the menu of 2014 Dylan Days activities scheduled at this point in time. Meantime, as for today, why wait till spring to have a good time. If you haven't firmed up your plans yet for this evening, there are Valentine-themed art openings at the Washington Galleries and the PROVE in Duluth. And for fans of Dylan music, Cowboy Angel Blue will be performing at V.I.P. Pizza on Tower Avenue in Superior. Life goes on all around you. Engage it. The debate may go on for years. Just as the debate regarding who was the greatest magician, Houdini or Howard Thurston, once was all the buzz near a century ago, I think there will be an ongoing debate regarding the greatest Hollywood film about magic and magicians, though on a much smaller scale. I have already written about The Prestige, first of the two candidates, and this morning am making my case for The Illusionist. From the opening notes of the film's score by Philip Glass I was enthralled. The feel of the film from the opening credits into the opening scene was itself so convincing, so perfectly rendered and magical. High expectations were created by this wonderfully mysterious, graphically aesthetic ambiance and the film delivered on that promise. If you do not know the film, the featured stars are Edward Norton, Paul Giamatti and Jessica Biel, though Rufus Sewell as Crown Prince Leopold helps the film. As noted above, the opening creates a beautiful suspense. At two minutes in one is already prepared to weep. The melancholic beauty of the score runs beneath the skin directly into your veins, and is swiftly conveyed to nerves and heart. The film then flashes back to show us how we came to this electrically charged moment. The film is a love story at its core. When Eduard was a poor boy from the lower class his childhood sweetheart was the upper crust Sophie (Jessica Biel). The heart of the story is the great lengths to which Eduard will go to obtain his heart's desire. But it also an inside look at what magicians were about, and how people respond. In one scene Eisenheim has been asked to entertain the Crown Prince and his guests at a private party. In this scene Eisenheim performs a number of stunning illusions, one of them being to make a small orange tree grow and produce fruit, within minutes. The trick becomes a recurring theme in the film because Inspector Uhl keeps wanting to know how it is done. What's astonishing to me is that this orange tree trick was actually one that Houdini once did. It went like this. At the Chicago World's Fair, before Houdini had really made a name for himself, he did this routine where he would be dressed like an Indian fakir and play a little flute or whatever he did while cross-legged on the ground trying to attract a small crowd. He had a sheet or something lightweight laid out and he would then take a seed and "plant" it. He would make music and there would be a slow rise underneath and he would peel back the sheet to show a six inch sprout. He covered it, played a little more and it grew, grew and became a small tree with fruit. In other words, what we saw Hollywood do on film was an illusion that Houdini himself invented and performed as a young man. One other touch I especially liked was the story within the story of how Eisenheim became Eisenheim. The tale of his meeting an old magician is straight out of the Borges tradition, and mystical realism, a form of story became the spark which lit the flame of my own inspiration for several of the stories in my newly published volume Unremembered Histories. Meantime, if you've not seen the film, it's a wonderful journey and the payoff is satisfying. May your own life continue to be filled with magic. Now that the cold is beginning to break it seems the inevitable snow will return. Forecast is minimal compared to December's multiple blankets. From our earliest days here in the Northland we're told to dress in layers, and that is what December did, dressing our houses and yards and countrysides with blankets of snow. ''Tis deliciousness to the eyes, though, when the sun sends its arrows of brilliance cascading off all that snow-white purity. All that to say that whatever the weather we won't be stopped for this week's events. Friday evening there will be Valentine's Day openings at the PROVE and the Washington Galleries. When the call went out for this show, they said they were looking for "funny, silly, sappy, quirky, corny, odd, goofy, and peculiar musings on love and romance in the form of visual, written, or fine art for a show opening February 14th entitled "My Funny Valentine." I had a couple pieces I wished to submit but circumstances interfered and I will attend only as a fan of the gallery and spectator. Babes in Arms happens to be a film about two struggling artists trying to make their way in show biz. Northlander Judy Garland also starred in The Wizard of Oz that same year. Born Frances Gumm, Ms. Garland learned that show biz can be a rough and tumble world whether you're struggling to make it or have it made. Quaintrelle (n): A woman who emphasizes a life of passion, expressed through personal style, leisurely pastimes, charm, and cultivation of life's pleasures. According to their Facebook announcement, From Cleopatra to 'Mrs. Dalloway' to Beyoncé, women have been creating and enjoying the finer things for countless generations. This Valentine's Day, ditch your dates (unless they're cool, then they can come) and celebrate sassy ladies, exciting art, a multimedia project (45 minutes, 7 videos, 5 spoken world pieces, 4 live songs), and poetry readings. The lineup of artists looks impressive: Justin Edberg and Brittany Kruger, Tonja Sell, Brent W. Kustermann Art, Sarah Riley, Alison Price, Sarita Zaleha, Aphtin Rapp, Tim Byrns, Arte de Moira, Marissa Murdy, Susanna Gaunt, Gena Sophia Triefenbach, and Taylor Berman. There will also be a multimedia project by Kate Harrison and friends. Plus poetry by Alethea Tusher, and, for your enjoyment they're promising a surprise (because everyone likes those on Valentine's Day, right?). Big "Shout Out" to my daughter Christina whose birthday it is today. Are you really only 25? Seems like you have seen and done so much! Happy Birthday! Two book signings have been slated for Unremembered Histories, my first volume of short stories. Tuesday March 4 I will be donating two copies of the book to the Superior Public Library and sharing a few words before about things I've learned as a writer and publisher. 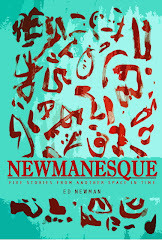 The afternoon of Sunday March 30 I'll be signing books in Tampa, Florida. Can't make it? Tell your local library to purchase one for your own community and maybe you can read it for free? It's been available on Kindle since 2011, but we learned that most folks still love the feel of a book in hand. I'm personally very pleased with the way the cover feels, and the black text on cream-colored pages looks nice, too. And finally, the North Country Dylan Fest is just around the corner with its various events both in Hibbing and the Twin Ports. One of these events will be a Dylan-themed art show at the Red Mug (Superior) during the month of May. An official call for art will go out any time soon now. I will keep you posted. How Cold Is A Real Arctic Blast?